A decade ago this month, while waiting for Eric in a bike shop, I found a Lonely Planet book called Cycling the US West Coast. Lonely Planet made cycle touring sound like lot of fun. I had just bought Scheherezade a month before and was ready for new cycling adventures. I decided that, if I started right then, I could, by the following Labor Day weekend, train myself for a bike tour. I had no idea that finding that book on the bike shop shelf would be a life-changing experience. For the last ten years now, Eric and I have trained ourselves for and then completed at least one overnight bike tour every year. We've gone amazing places and had incredible adventures together on our two wheels! Many things, particularly a local WorldCon, made it difficult for us to find time to train this year. It's generally more difficult to train in summer than in spring, and I've now decided to be sure to plan future tours for no later than the Fourth of July weekend. This year, we had only seven training days, and we didn't even manage to ride all day a lot of those days. Eric was working far away in Milpitas, and while he was riding 20 km/12 mi per day a couple of days a week to get to and from his workplace, the terrain was mostly flat. The time he spent commuting left us with no time for weeknight rides most of the summer. This was probably the least training we'd ever done for any of our bike trips, other than the two tours we completed a decade or so before I found the book, one lackluster and the other downright discouraging. 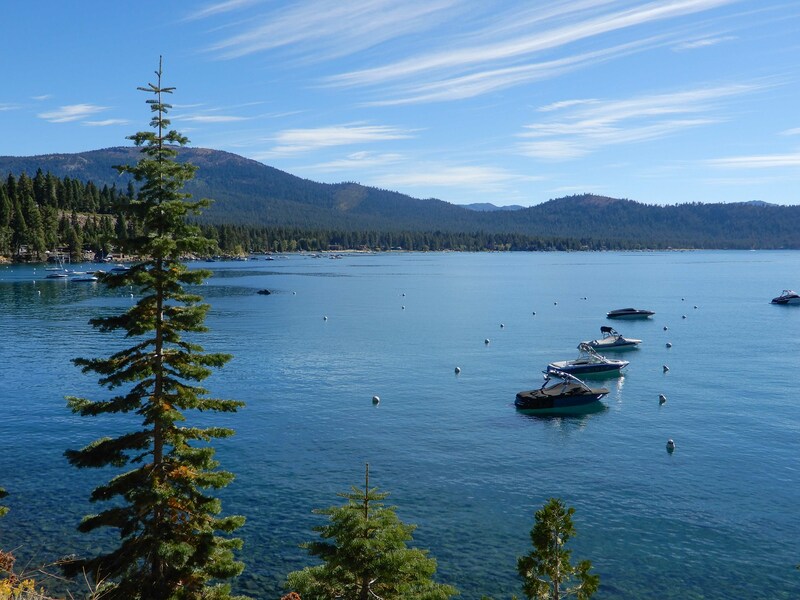 But we had ridden around Lake Tahoe before, and Eric convinced me that, if we did it as a credit card tour rather than as a camping tour, it would be fine. 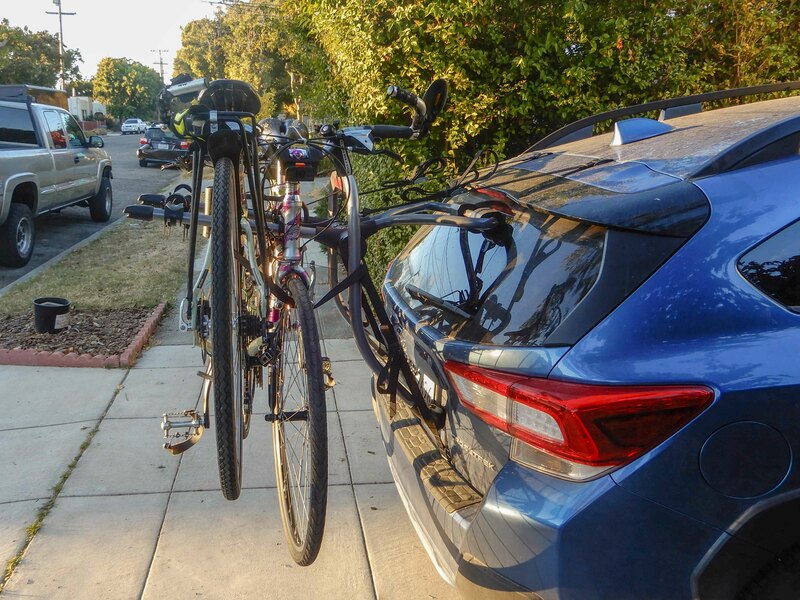 Eric took a picture of Screech and Sheherezade on the new bike rack he bought to go on Mather. 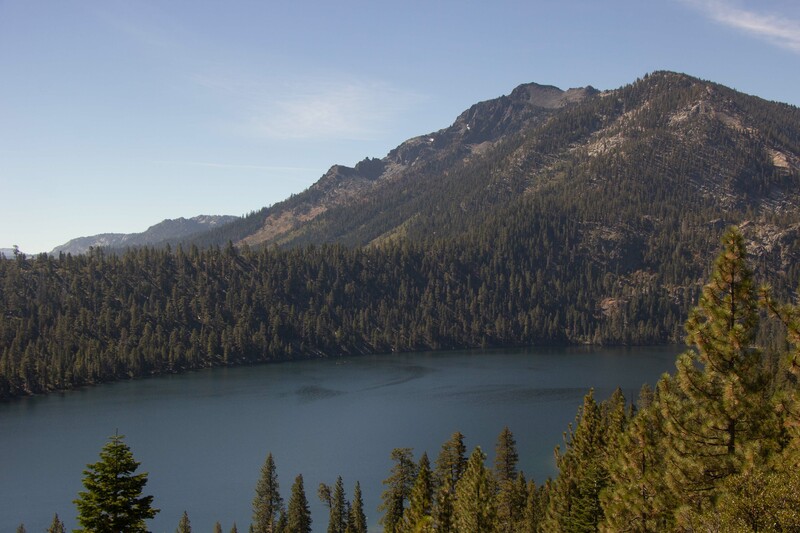 The previous time, we had stayed Friday night at a motel in Kings Beach, about noon if you look at the lake as a clock face, which, with camping at Camp Richardson in South Lake Tahoe, split the trip fairly evenly by distance. 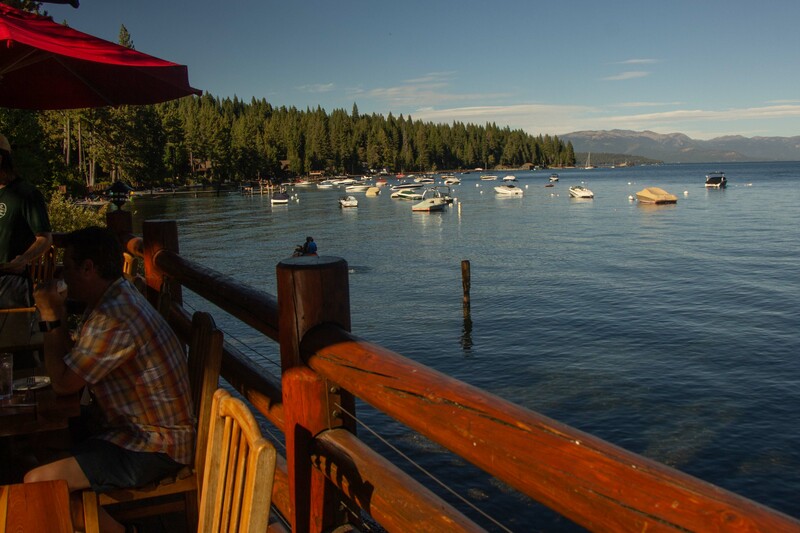 We were still planning to spend Saturday night in South Lake Tahoe (although in a motel this time), but the place in Kings Beach had closed. 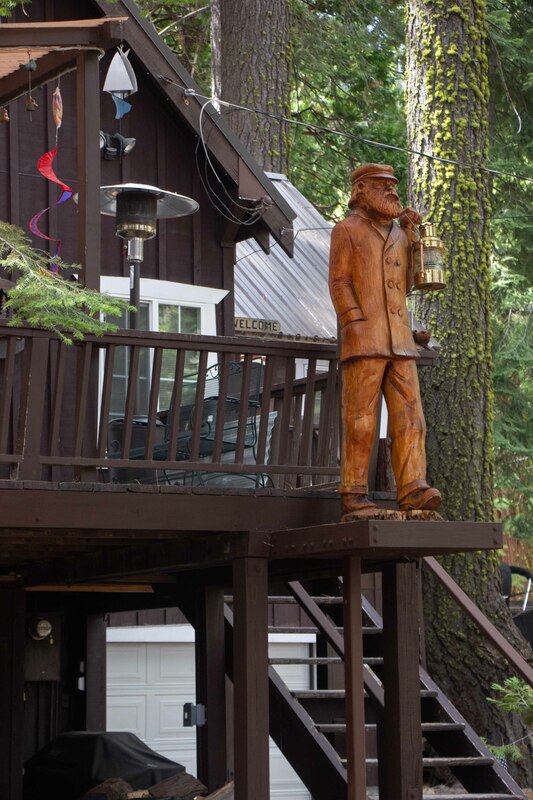 I found a place in Tahoe City, about 10:00 on the clock face. While this would leave us more distance to do on Saturday, on Sunday we would need time to drive back to the Bay Area, so we decided that was a better split. 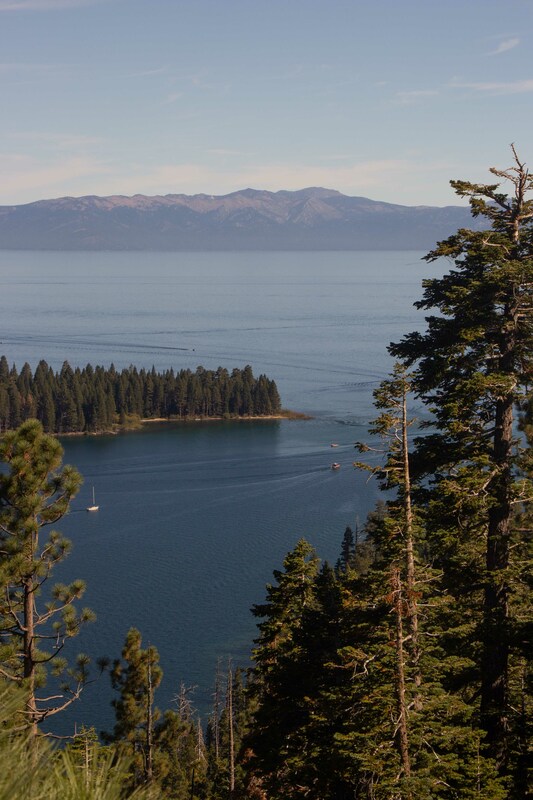 I drove us up to Tahoe City Friday night. We got to bed at a decent hour, but did not sleep well. The Americas [sic] Best Value Inn had only fruit and trans fat pastries for breakfast, so we had fruit, Clif bars, and turkey jerky for breakfast. We managed to leave at 8:39. We rode around the north shore. We weren't going steeply uphill, but the going seemed hard, even though we had only overnight gear and not camping gear. Fortunately, we had protected bike paths to ride on when we were climbing, and good shoulders when we didn't. Until, that is, we crossed the Nevada state line, around 11:00. Much of the rest of the day was a struggle to manage traffic. Still, the scenery was pretty, and the weather could hardly have been more perfect. I had somehow ended up with an uncharged camera battery, despite having carefully charged the battery. 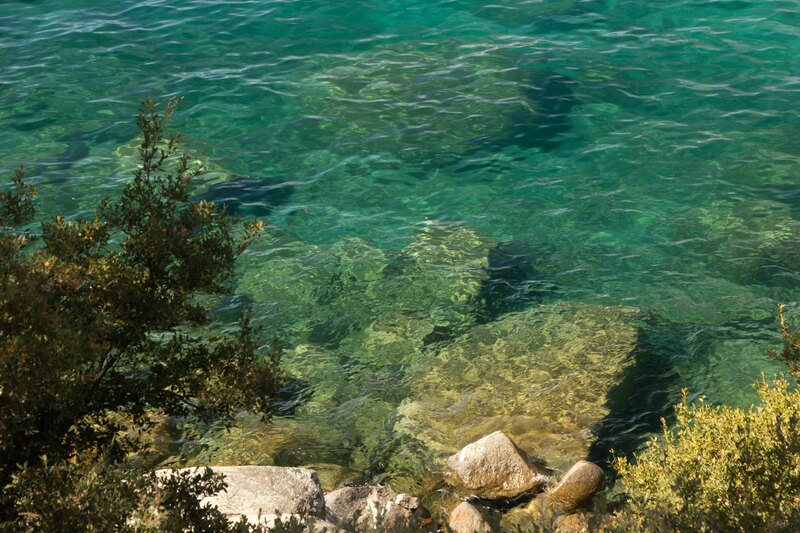 So, I took only a few photos, such as this one demonstrating the beautiful clarity of the lake. Lesson: Always bring an extra camera battery, even if you are on bike tour. We had remembered a nice visitor center, but it turned out to be much further from the state line than we'd remembered. We had planned to stop there for a snack and to plug in my battery charger for a few minutes. We found the lovely visitor center about two minutes after we had finally given up and had a snack by the side of road, assuming we must have missed it. 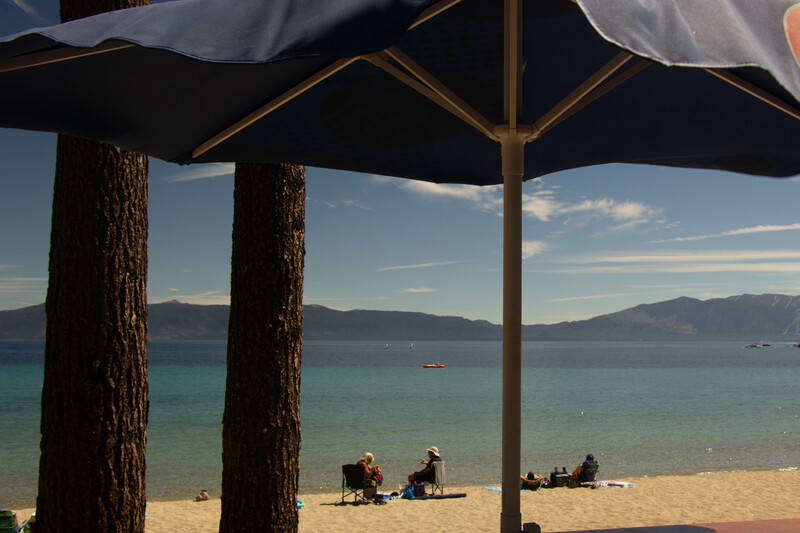 Not only did it have clean bathrooms and fresh Lake Tahoe water, I was able to get a significant charge into my battery in just a few minutes. The staff was very friendly and helpful! I had been carrying our communal bag of snacks, but Eric decided it was slowing me down too much and took it from me. We stopped and bought sandwiches at a restaurant by the roadside, and I carried those. Immediately thereafter, we faced signs warning of potential half-hour delays, because the state was narrowing the highway to one lane for construction. We were able to pass the stopped traffic and did not have to wait, but we had a hairy ride through a narrow construction zone with cars too close to us. Eric celebrates the end of the construction. We faced many climbs in poorly-shouldered places like this. The construction did have the effect of separating the cars passing us into groups, which made it easier to make progress in between groups of cars and then just stop and let them pass us. Photo by Eric. Slowly, we climbed up to a 2,152-m, 7,060-ft rise. Fortunately, we had slept at 1,890 m/6,200 ft. We rewarded ourselves with our sandwiches. There was no nice picnic area; we had to eat at an ugly spot by the roadside. 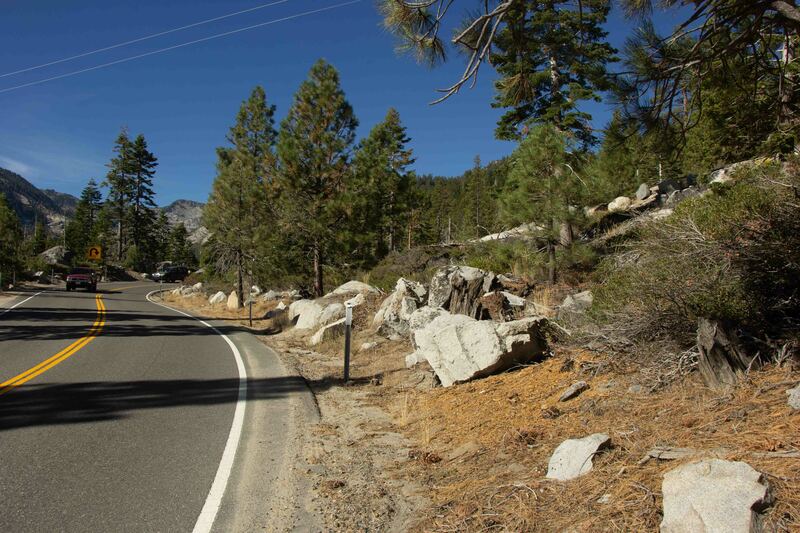 At the summit, we left NV 28 and turned onto US 50. This began with a fabulously fast descent, but, once we were no longer descending, the traffic was horrible. I tried to do what cycling advocates are always advising, which is to ride in the lane, so that traffic is forced to move into the left lane rather than passing you too closely. I was surprised at how well and reliably it worked, but it rattled my nerves. I spent a lot of time fuming and saying I was never doing another bike tour on state or federal road again. There was a tunnel that was supposed to have lights warning of bicyclists, but the lights were not working. Fortunately, it was a very short tunnel. 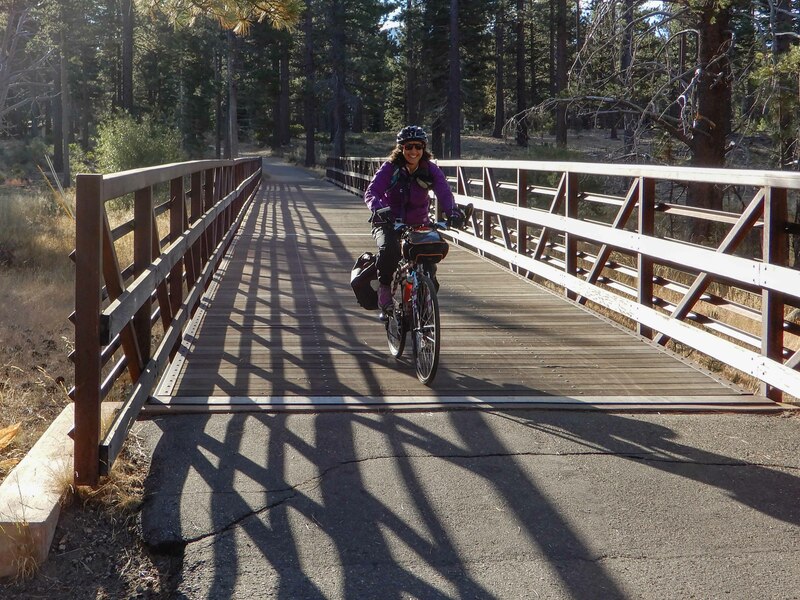 We hardly got any breaks from riding, because we had found most of the best geocaches on our last Tahoe tour five years previously, and my geocaching planning for this trip had been rushed. We found no caches in Nevada. The best experience we had on the Nevada part of the trip was meeting a couple of lesbians with kids and dogs. Eric had some fun petting a wet dog, and the people were very friendly. They said they liked to mountain bike on the nearby flume trail. 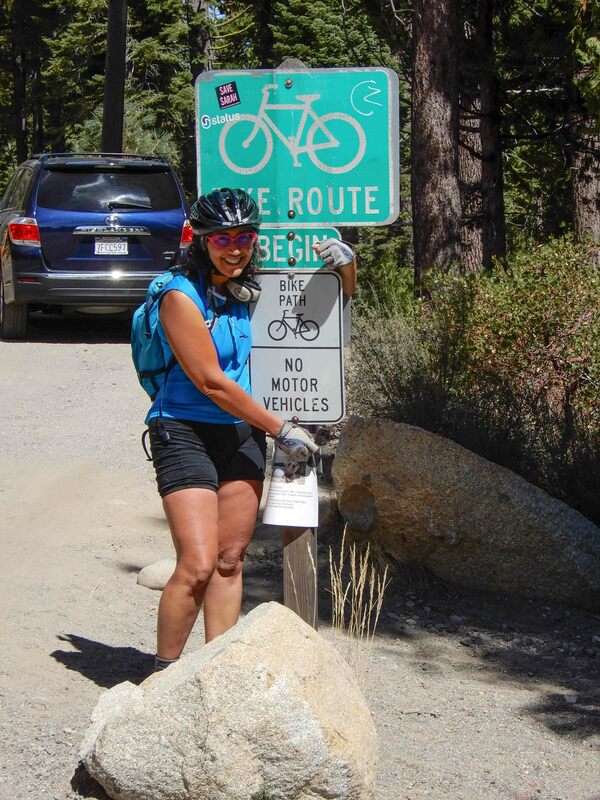 At the California line, we entered Forest Service territory, with fabulous off-road bike paths. It was a tremendous relief. Eric took a picture of the scenery at the south end of the lake. 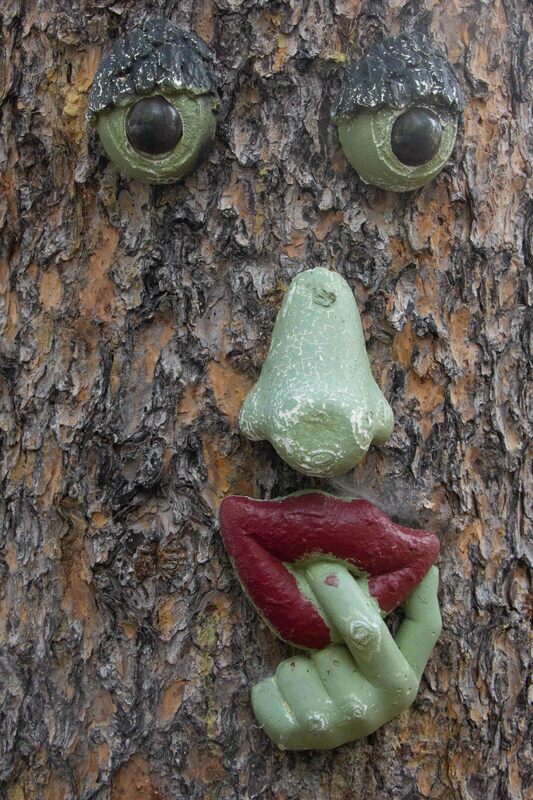 We found only one cache for the day, a cute front yard cache where someone had made art with their trees. At 16:39, we arrived at Sunray Tahoe Hotel. It had a cute gazebo in the courtyard, but the actual room was unbelievably ugly and clearly hadn't been redecorated since the 1970's. We found some reasonably good burritos across the road for dinner, and went to sleep before 20:00 so that we could rise early the next day. 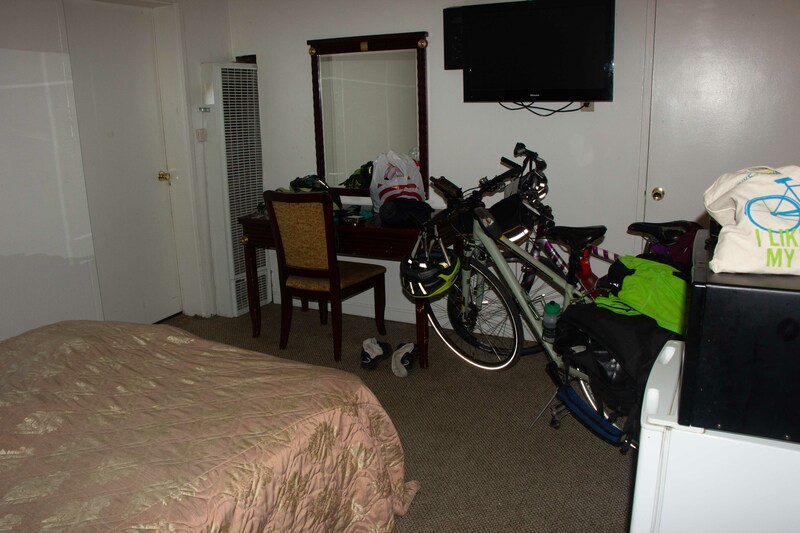 I went to bed thinking that what was memorable about bike trips was not so much the riding but the stops: the picture overlooks, the little bits of roadside art, the conversations with other travelers, the comfortable visitor centers, the funky little sandwich shops, and, of course, the geocaches helping us find the best places. With little geocaching, bike touring was nowhere near so much fun. 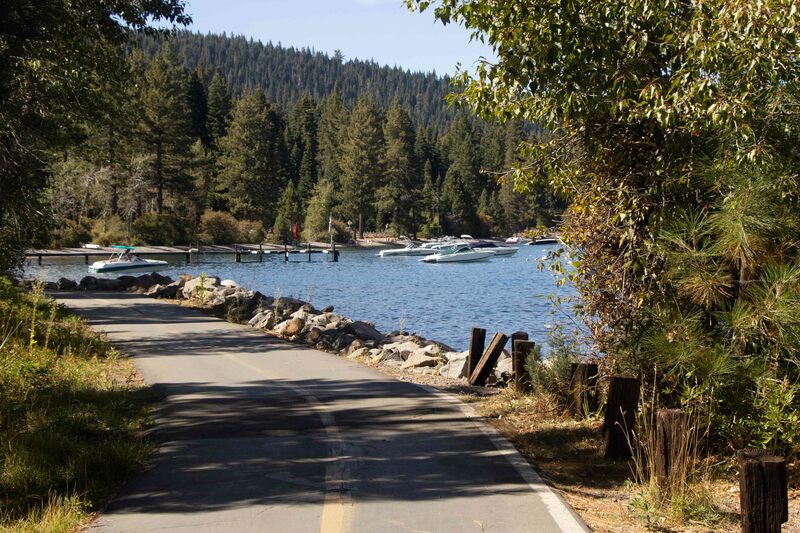 We had chosen this particular weekend for our tour because Sunday was the Tour de Tahoe, a supported one-day bike ride around the lake. 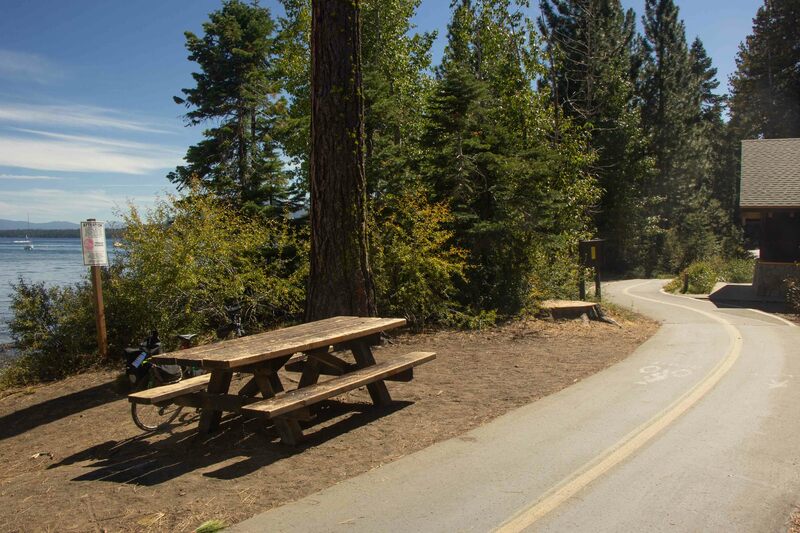 We can't ride 110 km/72 mi in a day, but we wanted to take advantage of the extra warning signs and cycling infrastructure that the ride would bring to the roads, particularly on the very steep climb up around Emerald Bay. 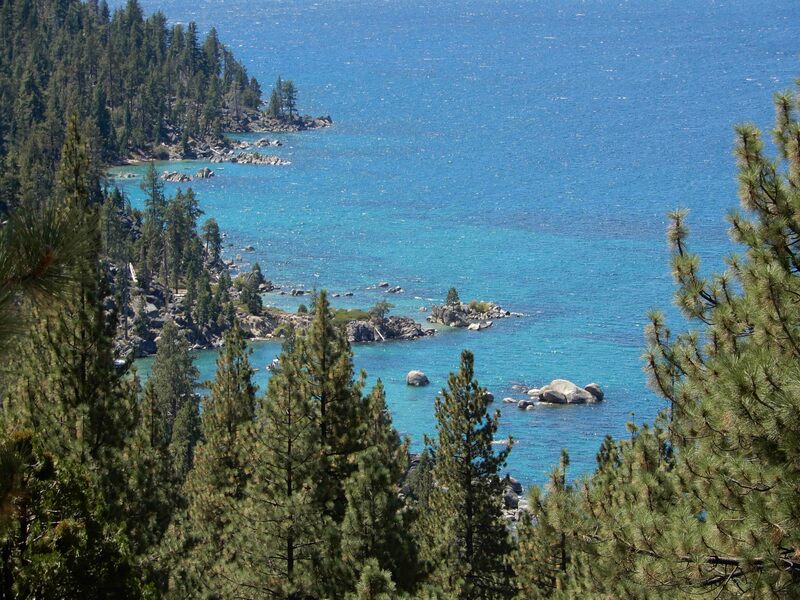 We had done this by accident on our previous Tahoe trip, and it had worked very well for us. 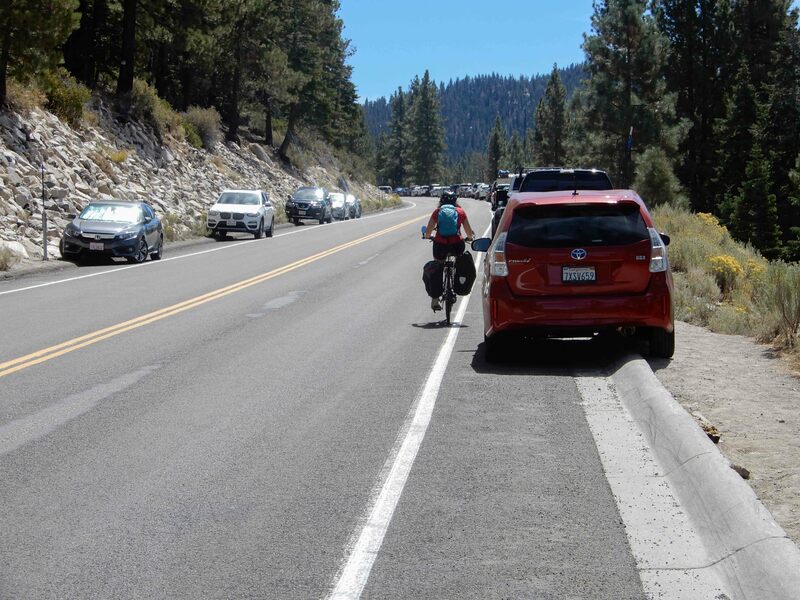 However, we didn't want to ride with the Tour de Tahoe cyclists, because most of them would be much faster than we were, and many of them would be using those rapidly flashing LED's that just hurt the area behind my eyes. We planned a departure at 7:30 to give us some time to find some time to find some caches but be behind most of the Tour de Tahoe riders. We got up at 5:00, and somehow, unimaginably, after eating leftovers and snacks for breakfast, were ready to go at 6:20. This was much too early; we'd be in the way of many much faster cyclists. We went looking for a coffee shop that might have had better bandwidth than our motel, but all we found was a 7/11. We brought some tea and coffee back to our hideously ugly room. I realized, too late, that we had probably missed a fabulous opportunity to photograph the sun rising over the lake. We left at 7:25, and were thrilled to find ourselves on a totally protected bike path through the Forest Service territory for the first 12 km/7.5 mi of our ride. 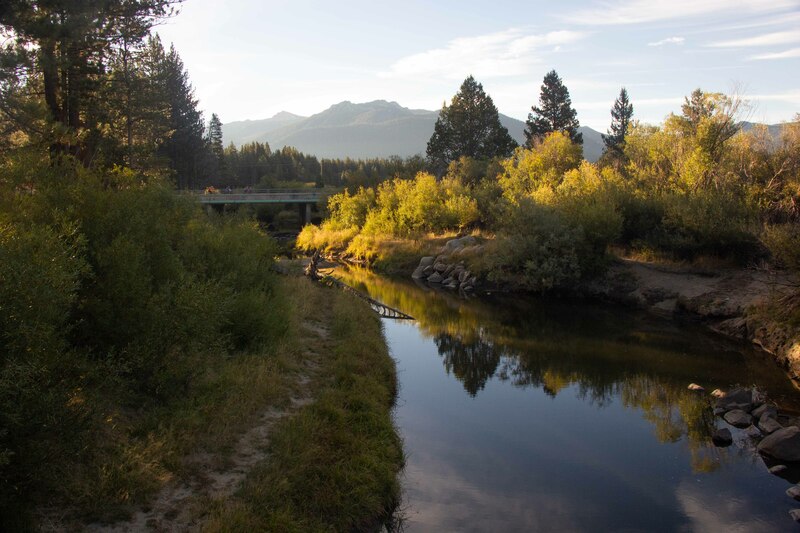 The Forest Service had even built bridges over the streams just for cyclists. Eric took a picture of me crossing another bridge. 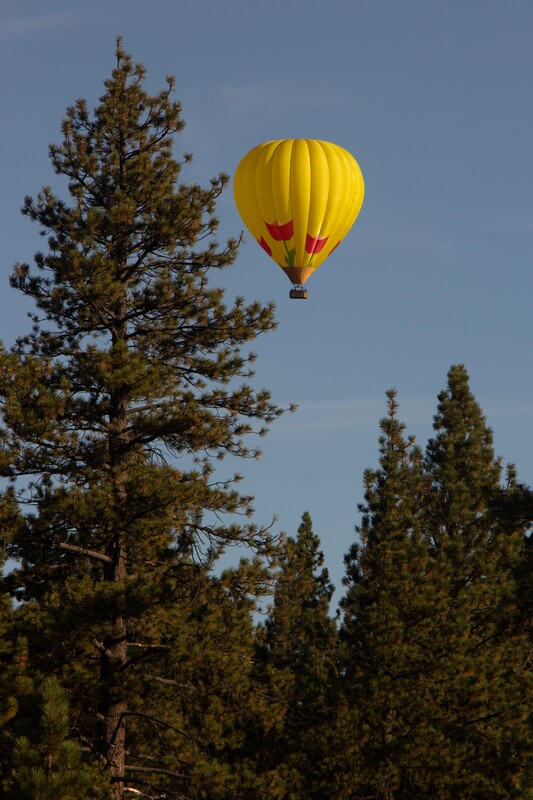 At the site of the first cache, Eric spotted this balloon in the sky! 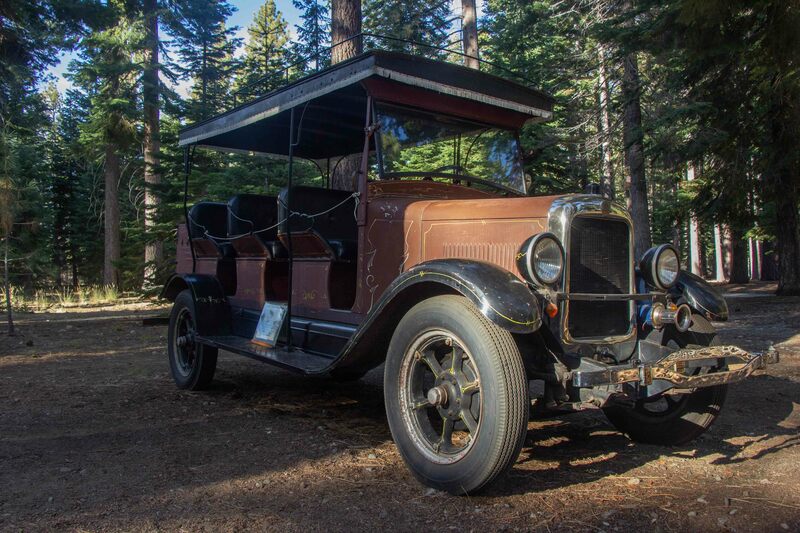 The site of the second cache had a circle of antique vehicles, including this 1928 GMC 1-ton truck converted into a bus. 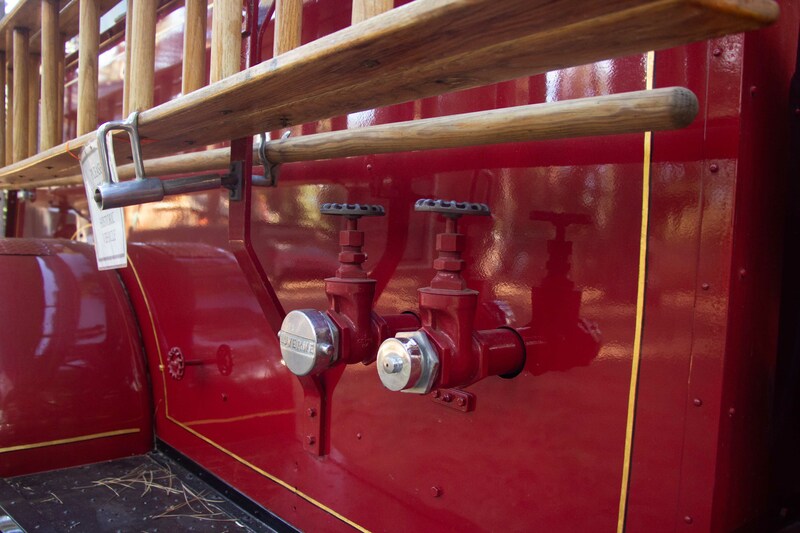 1919 Pierce-Arrow Model R-9 5-ton truck, also converted into a bus. 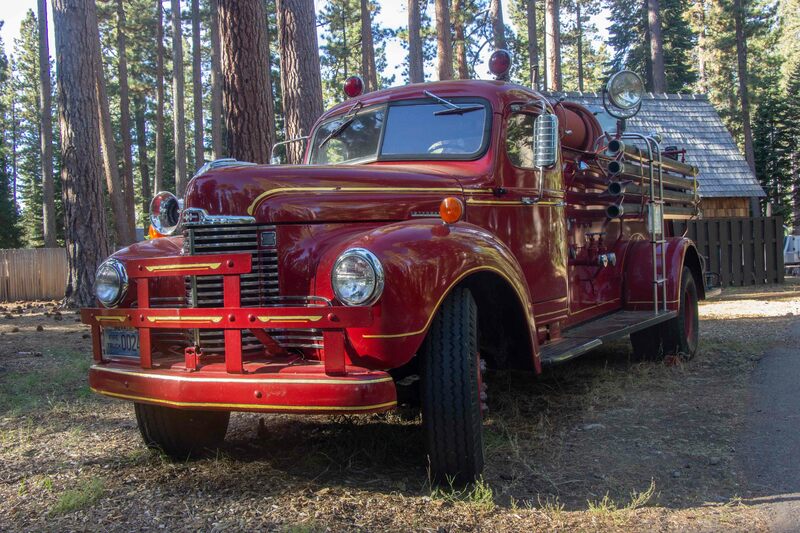 My favorite was this fire truck, but I couldn't find a sign telling me the make and model. 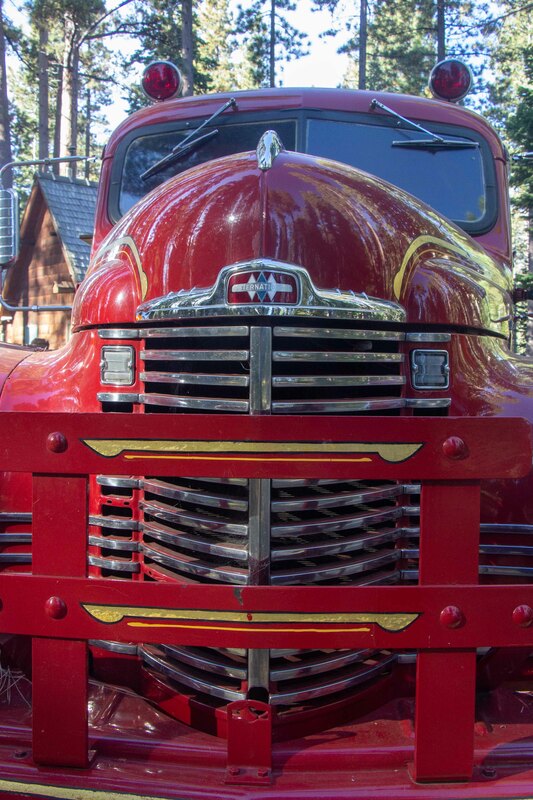 The fire truck's imposing grill. Obviously, we had become too distracted by geocaching, and were now further behind than we had intended. We skipped an earthcache and pressed on. The bike path ended and we headed out onto CA 89. It was as poorly shouldered as the roads had been in Nevada, but it wasn't as bad because the speed limit was lower. 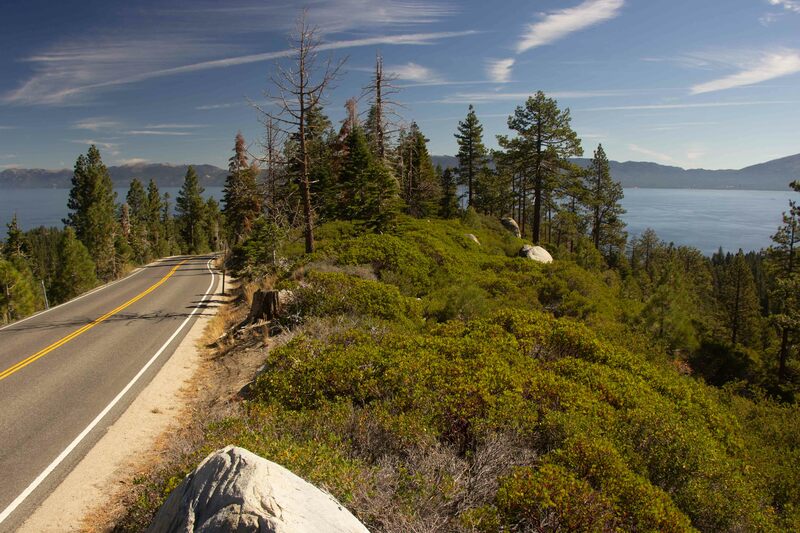 We soon began the steep climb up around Emerald Bay, with hairpin turns like this. We found no caches, but we were surrounded by lovely scenery. My favorite spot was this saddle in the road. 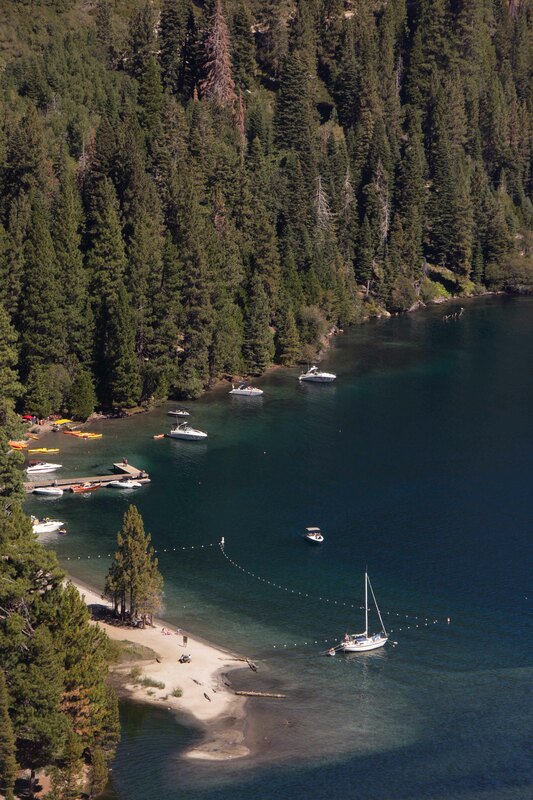 ...and on the east side is even more stunning Emerald Bay. 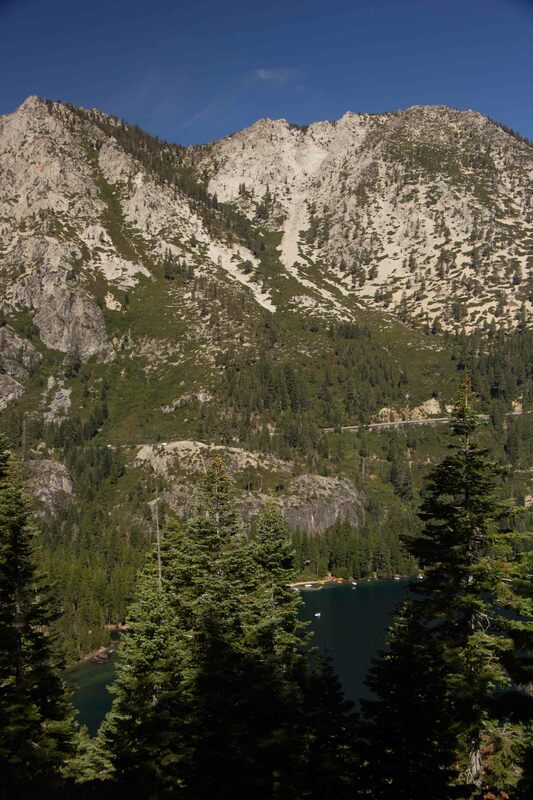 From the saddle, we could see, across Emerald Bay, the climbing we still had to do. 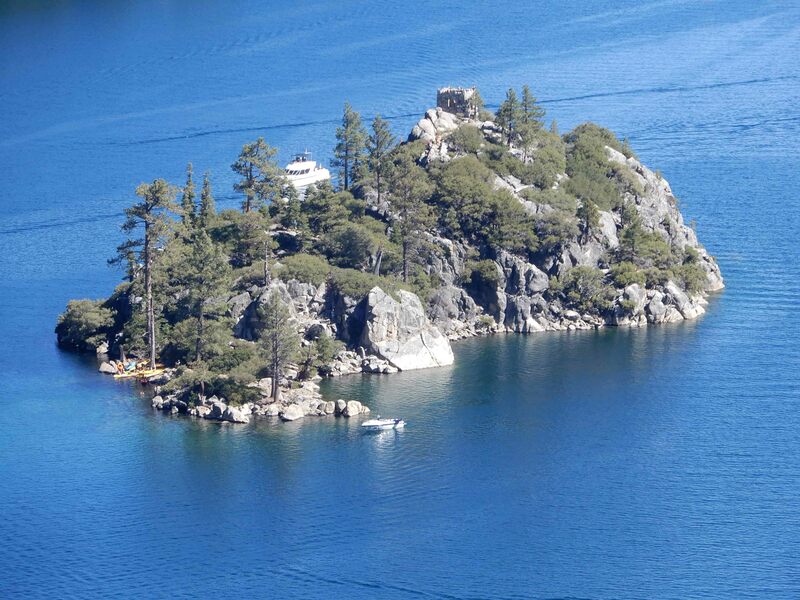 Eric took a picture of Fanette Island in Emerald Bay. As we chatted with a couple of young gay men from Bakersfield in a beautiful blue Mustang convertible, I took a picture of the harbor of incredibly clear water below. We stopped for a great chat with a husband and wife from Cairns, Australia, slightly older than we are. They were on a 14-week tour of the US, and had been all over the western part, including Alaska! 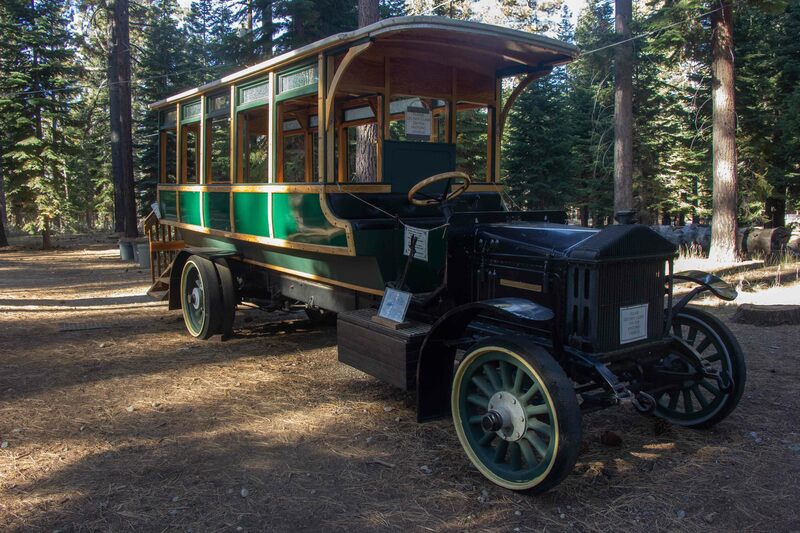 They were headed back to their starting point, Los Angeles, via Yosemite, and from there they were going to fly to the northeast to see Boston, New York, and the New England fall foliage. At last, we reached D.L. Bliss State Park, at the top of the hill! Then we had a great roll downhill. We made a stop to rest our hands, and decided to have a little lunch at Meek's Bay, which was not much further up the road. We mistakenly went first to the Forest Service area at Meek's Bay. 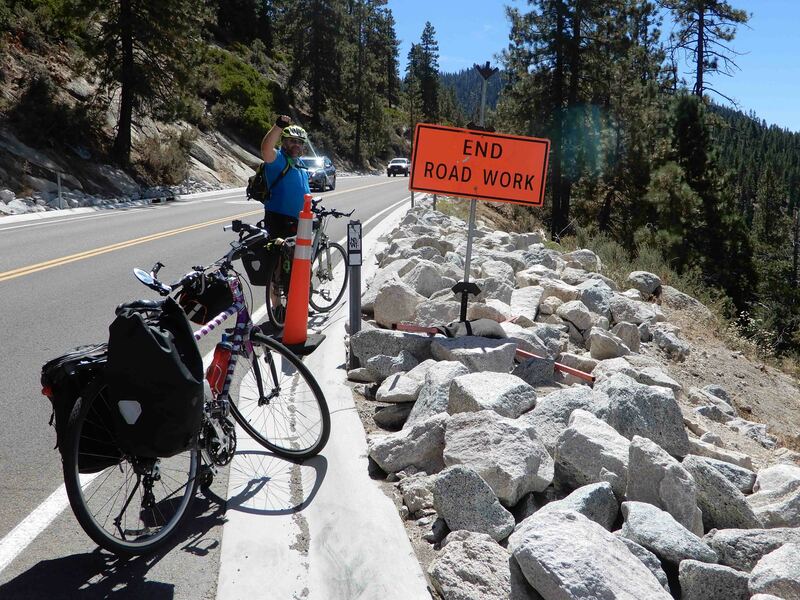 It free for cyclists, which was fortunate, as we had left our park pass in Mather back in Tahoe City. But we remembered a private Meek's Bay Resort, with a great concession stand, from our last visit. The resort also let us in free without a car. It's an incredibly pretty beach. We had great chicken strips and fries. 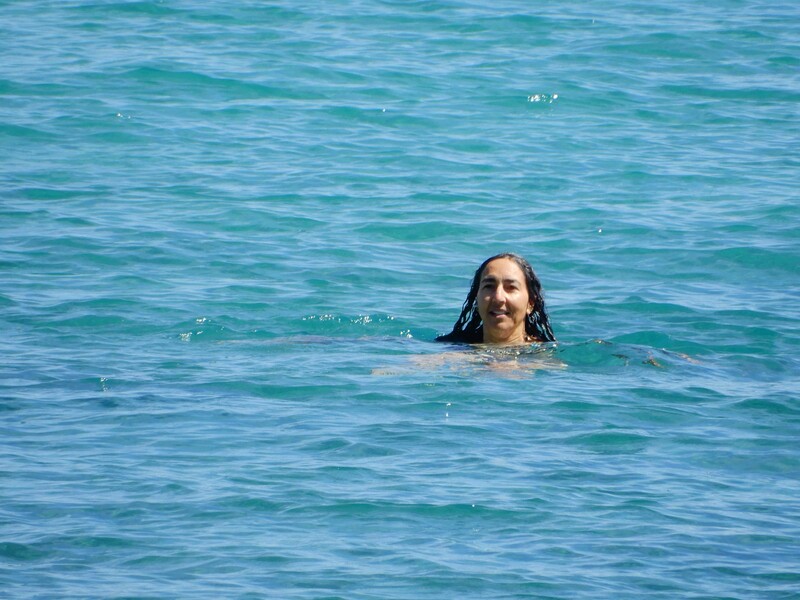 I took a bracing dip in the lake that left my lungs feeling incredibly worked out. Photo obviously by Eric. Eric dipped his feet in the cold mountain water. We were entertained by a woman doing yoga on a stand-up paddleboard. 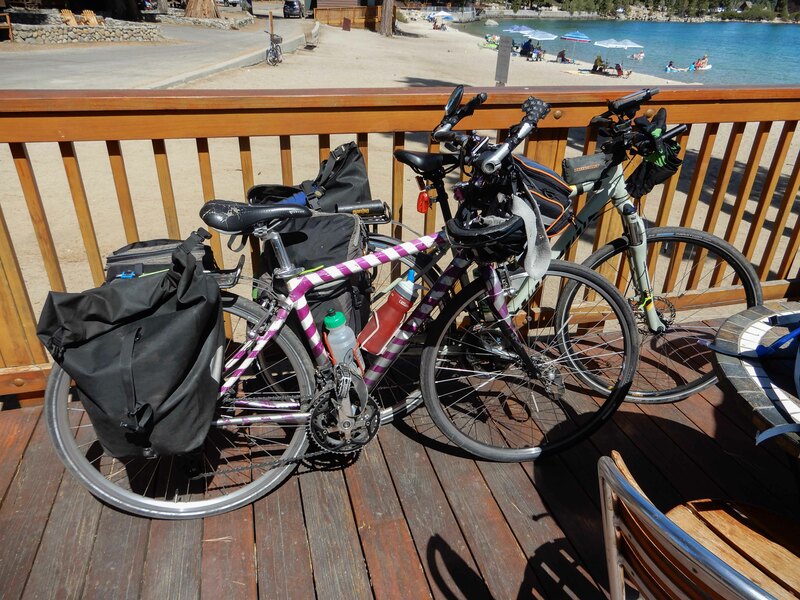 Eric took a picture of our bikes on the deck. While we weren't camping, we were still fairly well loaded down. We headed out of Meek's Bay around 13:15, and, just a little bit further along the road, we came to a protected path. 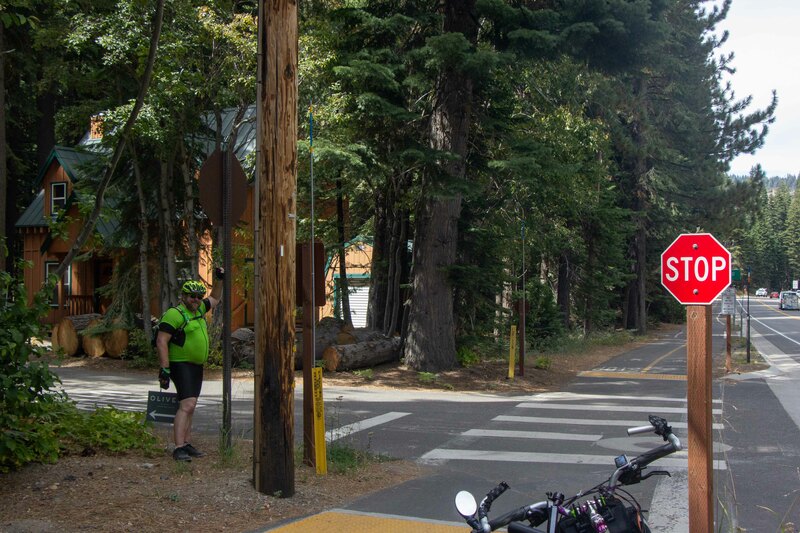 This was particularly valuable because, by this point, the operators of the Tour de Tahoe had taken down all of their cones and signs. Eric took a picture of me hugging the sign for the bike path. The bike infrastructure that the state has put in on CA 89 here is mostly impressive: completely off the road and occasionally beautiful. In most places, it's a dedicated bike path, but in some places it takes you along mostly well-marked side streets. On one of the side streets, we rode past a house guarded by this attractive mariner. But there are some problems. At every intersection, the state has erected these little stop signs. In the picture, you can see that Eric is pointing to a regular stop sign for any traffic coming from the side street. There is no more reason for bicyclists to stop at this intersection than there is for the auto traffic on CA 89 to stop. The bike route also crosses CA 89 in several places. I guess this is because they wanted to build it on the lake side of the road, but there were places where that is private property. 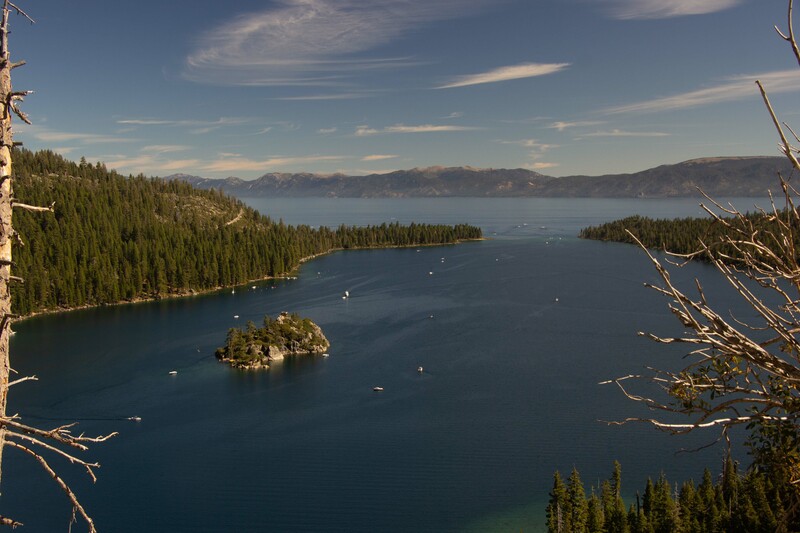 I grumpily reiterate my belief that Lake Tahoe should have become a national park. But it didn't, so the path had to cross the road. In one place, the crossing was marked from only one direction, which was not the direction from which we were coming. Both we and two cyclists in front of us missed it. We saw them climbing up a steep embankment to the trail, and they told us just to make the u-turn instead. We turned around, and found the path, but it was hidden until I was right on top of it. Not knowing how close Eric was behind me, I turned too quickly and sharply for the second u-turn, and ditched in the dirt by the side of the road. I suffered only minor scrapes, but this was frustrating because it was so entirely preventable. When the path ran along the lake, though, it was fantastic, with lovely picnic areas, and even plumbed bathrooms! We rode past views like this. 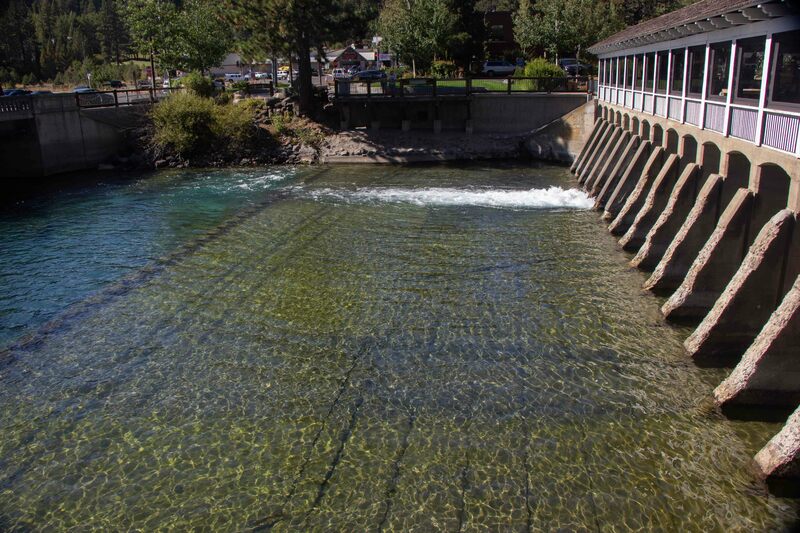 Back in Tahoe City, almost back to Mather, we stopped for one more earthcache, at the dam on the Truckee River. The cache listing told us that this had originally been an ice dam. 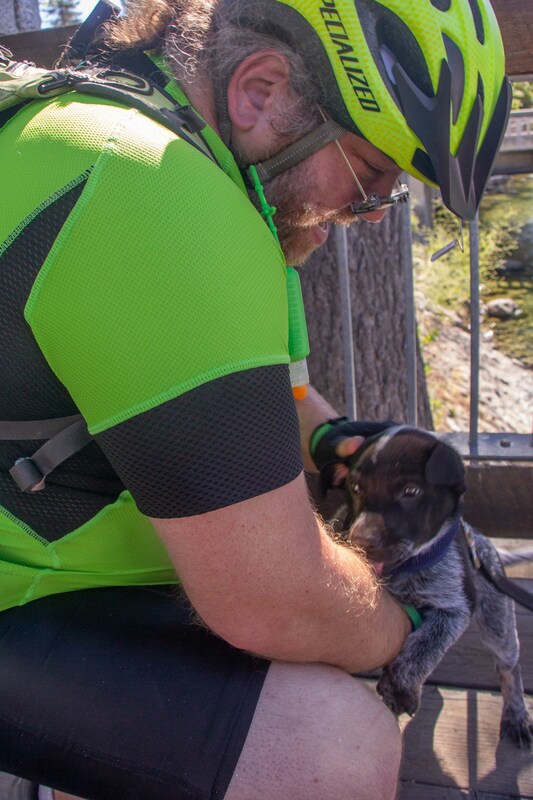 At the dam, we met this absolutely adorable puppy. The man with him expressed ambivalence about this fantastic little creature, saying that he had been perfectly happy with his older, untroublesome dog, but that his wife had brought home this puppy, who was currently having a good moment, but who was otherwise a source of trouble such as pooping on rugs and waking people up in the middle of the night. Who could possibly be annoyed by such a sweet little guy? We arrived back at Mather by 16:00, with enough time to reward ourselves with a nice dinner. I told Eric that my boss had recommended the nearby Sunnyside Resort, saying it was a fun, funky place. We know my boss likes unpretentious places, and we found it to be a friendly, informal spot, where people at both of the adjacent tables started conversations with us. We had dinner out on this fabulous deck. 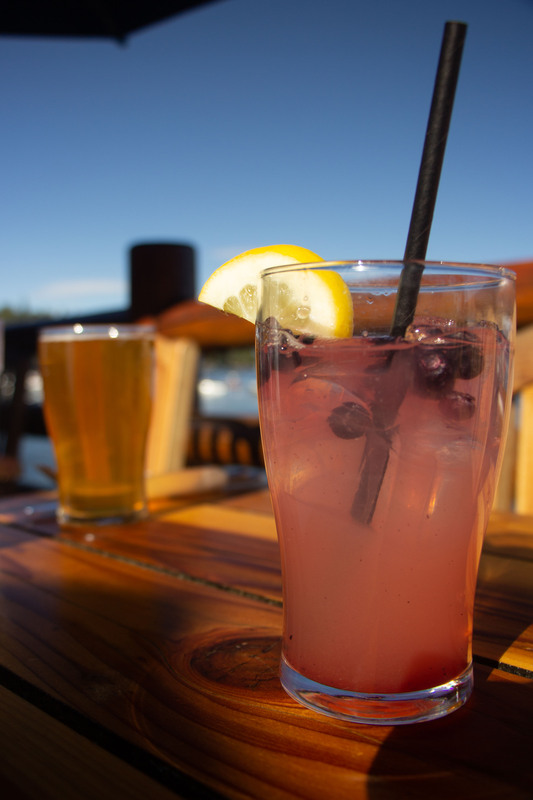 Eric had a very pretty strawberry cooler with blueberries. 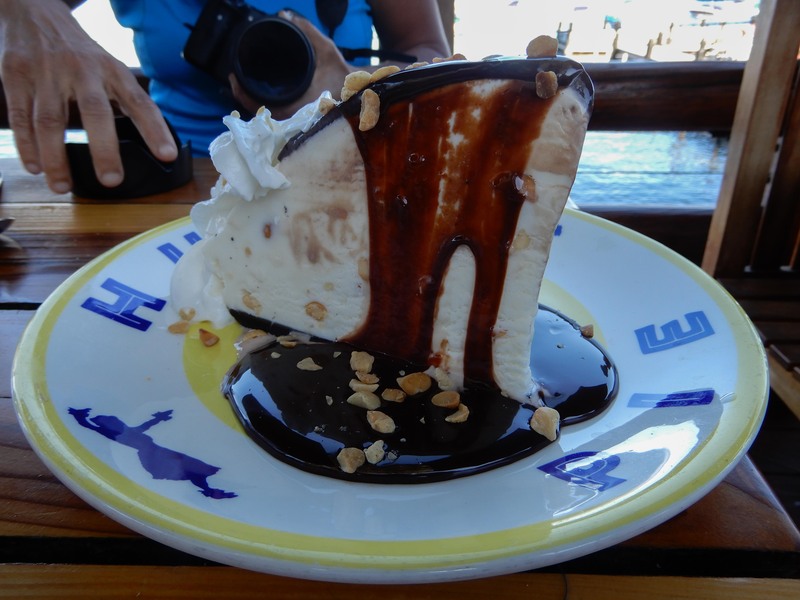 We ended our tour with this delicious macadamia nut ice cream pie. Photo by Eric. 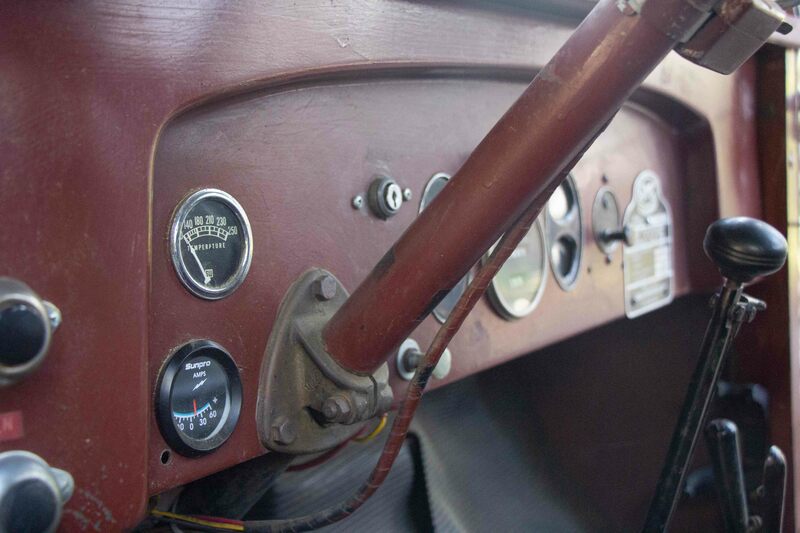 We got home in just under three hours, while rolling Mather's odometer over 10,000 miles (in less than seven months!). The second trip day was much better than the first, and left me feeling happy and satisfied. 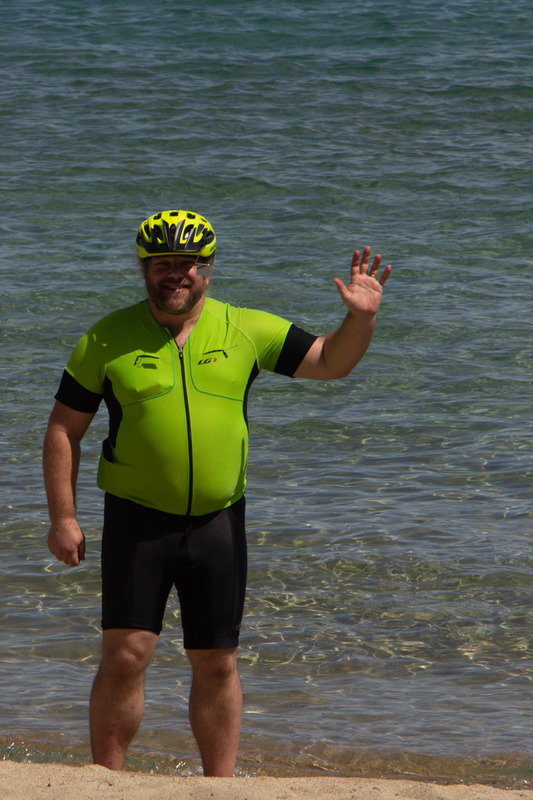 We are proud to have accomplished so many trips, and look forward to more cycling adventures together!